Meeting the needs of all Zoo visitors. We are committed to meeting the needs of all our visitors. We are always happy to discuss any requirements you may have to make your visit more enjoyable. Pathways throughout the Zoo are a combination of solid surface pavement and wooden boardwalks and are spacious enough to accommodate strollers, groups, and mobility devices. Manual wheelchairs are available for rental, on a first come first served basis, at our Admissions window for $7 each. Guests requiring the use of a mobility device are welcome to bring their own to the Zoo. If you have questions or concerns please feel free to contact the Zoo at 407.323.4450 ext. 100 prior to your visit. Service animals are welcome at the Zoo. Personal pets are not permitted on Zoo grounds at any time. Because service animals can pose certain concerns and challenges within a zoo setting, it is important that we advise you of our policy regarding these animals and ask for your cooperation. 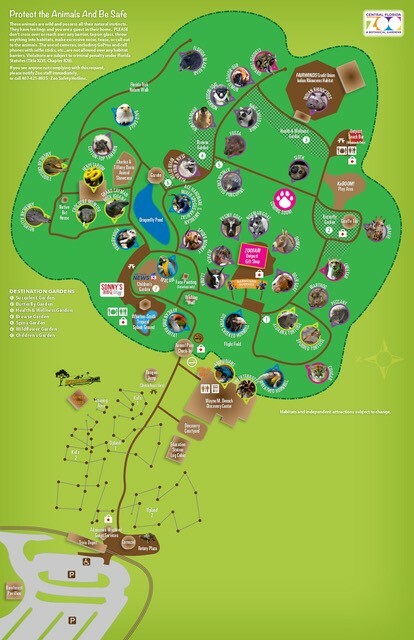 All guests visiting the Zoo with a service animal, including Zoo Annual Pass Holders, are asked to check in at the Admission Window so that our staff can provide you with an Accessibility Map for our facility. In compliance with the Americans with Disabilities Act (ADA), service animals must be on a non-retractable leash of no more than 6 feet, a tether, or harness, unless these devices interfere with the service animal’s work or the individual’s disability prevents using these devices. In that case, the individual must maintain control of the animal through voice, signal, or other effective controls at all times during their Zoo visit. Due to the natural predator/prey instinct, some zoo animals may react quickly or violently to the presence of a service animal, which can cause injury to the zoo animal or even death. We ask that if you notice a zoo animal becoming distressed or overly aggressive by the presence of your service animal, to please leave the area immediately. Because we want all guests to be able to enjoy all areas of the Zoo, if you would like to visit a restricted area, we are happy to provide a guided walk-through of the area by a staff member while another member of your party supervises and safeguards your service animal. Thank you for your cooperation in planning your visit to the Central Florida Zoo!